Mount Gretna - A Coleman Legacy by Jack Bitner, a Mount Gretna resident. The entire deed is available here for reference. Apparently there is a recent update reflecting the custodianship by the Lebanon County Commissioners and The Sico Foundation, but which is otherwise identical; we do not yet have it to hand. There is also an excerpt containing the elements of the deed that seem very definite and unequivocal, yet which the board seem to consider subject to interpretation. Below is the Final General Development Plan issued to the trustees by the RBA Group of Mechanicsburg, PA. This was the basis for the trustees public disclosure and application for a state grant. It differs from the trustees' immediate plans in that their proposed educational center is considerably smaller than either of the concepts described within. Some of these files are fairly large; take a deep breath. 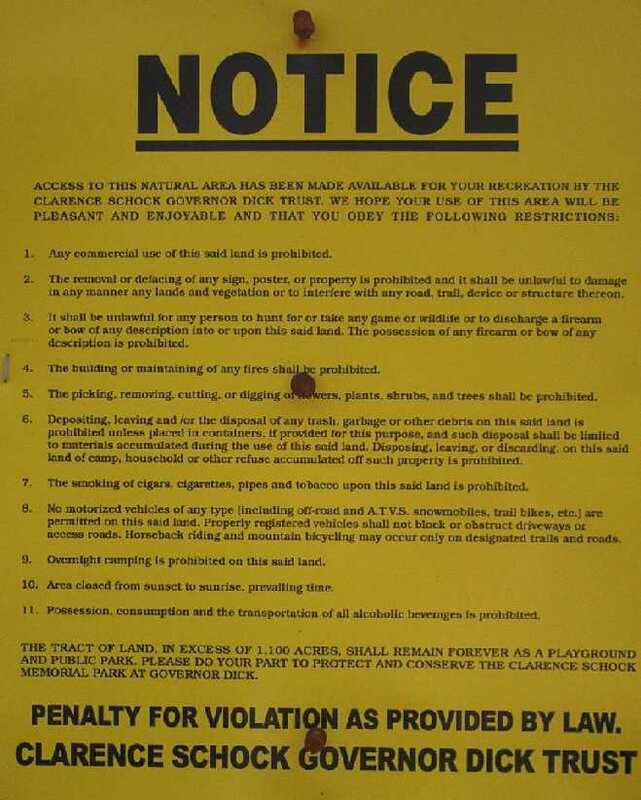 and regulations posted around the property. Below are the rules reprinted for better viewing. 1) Any commercial use of this said land is prohibited. 2) The removal or defacing of any sign, poster, or property is prohibited and it shall be unlawful to damage in any manner any lands and vegetation or to interfere with any road, trail, device or structure thereon. 3) It shall be unlawful for any person to hunt for or take any game or wildlife or to discharge a firearm or bow of any description into or upon this said land. The possession of any firearm or bow of any description is prohibited. 4) The building or maintaining of any fires shall be prohibited. 5) The picking, removing, cutting, or digging of flowers, plants, shrubs, and trees shall be prohibited. 6) Depositing, leaving and/or the disposal of any trash, garbage or other debris on this said land is prohibited unless placed in containers, if provided for this purpose, and such disposal shall be limited to materials accumulated during the use of this said land. Disposing, leaving, or discarding on this said land of camp, household or other refuse accumulated off such property is prohibited. 7) The smoking of cigars, cigarettes, pipes and tobacco upon this said land is prohibited. 8) No motorized vehicles of any type (including off-road and A.T.V.S, snowmobiles, trail bikes, etc.) are permitted on this said land. Properly registered vehicles shall not block or obstruct driveways or access roads. Horseback riding and mountain bicycling may occur only on designated trails and roads. 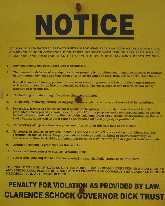 9) Overnight camping is prohibited on this said land. 10) Area closed from sunset to sunrise, prevailing time. 11) Possession, consumption and the transportation of all alcoholic beverages is prohibited.